Fire, smoke, blokes in gloves and pots galore! 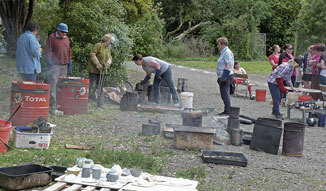 The recent raku firing, hosted annually by the Otaki Pottery Club, drew a steady stream of visitors, mainly families, looking to create a unique pottery artwork. 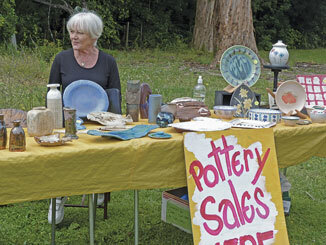 Based in the grounds of Otaki College, the community event is now in its 11th year, and not only promotes local potters and their club, but also gives visitors a hands-on art experience, incorporating an element of mystery, fun and excitement – there’s no knowing what the finished result will be. 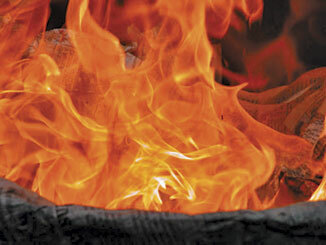 Western-style raku differs from the older, original Japanese method – the pots are reduced outside the kiln, rather than simply being allowed to cool in the open air, and the dramatic sight of a smoke-wreathed pot, emerging from its combustion chamber, no doubt contributes to the popularity of the low-fired pottery process. Raku is a Japanese word that can be translated as ‘enjoyment,’ ‘comfort’ or ‘ease,’ and although traditional raku techniques, such as the use of lead as a glaze ingredient, have been modified by western potters, it is raku’s unpredictable results and intense colour that continues to attract modern artists, both experienced and those that are newcomers to the craft. The definite presence of fire and heat is not for those of an anxious disposition, but for those folk waiting under the welcome shade of the college’s trees (the day almost had a summery feel), any feelings of apprehension went unnoticed. It was the excitement and anticipation that was obvious, visibly etched on waiting artists after their pottery was placed in the kiln. What surprises are in store when the surfaces are cleaned? It doesn’t matter, it’s the wonder of raku pottery, revealed.